What an awesome time we’re in. 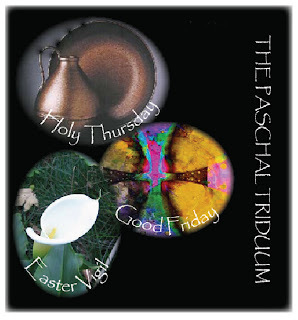 We are approaching the Paschal/Easter Triduum or the three most holy days in the Catholic Church's liturgical calender. It begins with Holy Thursday. We remember the Last Supper of Jesus Christ. That was when He had the first Eucharist and instituted the priesthood. It is followed by Good Friday where we remember the passion by having the service of the Cross. Some Hispanic cultures reenact the passion by having a procession down parish streets. This is the only day of the year where there is no Mass. Finally on Holy Saturday/Easter Sunday we have the Easter vigil where the Paschal candle is lit symbolizing Jesus’ rising from the dead. He is the light of the world. The Church is dark and only the light of the Paschal candle can be seen as parishioners later light their candles from the Paschol candle showing that we received our light from Christ who is The Light. We all celebrate the triumph of Christ over sin, human nature and death by rising from the death. We need these ceremonies especially today where so many are becoming agnostic or atheist for many reasons. The youth today are lost in sub cultures and only the light of Christ risen from the death can being them to clarity and serenity.